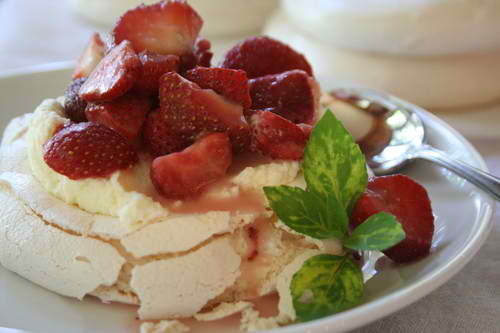 Pavlova is an elegant dessert which originated from Australia and New Zealand. It consists of a meringue base, cream filling and a topping of fresh fruit slices. It was first created in honor of the Russian ballet dancer Anna Pavlova during one of her tours to Australia and New Zealand in the 1920s. The addition of cornflour in the meringue gives the Pavlova a crisp outer shell with soft marshmallow-like center. Any fruit in season can be used as topping but the more common ones are strawberries, raspberries, peaches and kiwis. Here is an easy dessert recipe for the classic dessert Pavlova. Preheat oven to 150 degrees celsius. Line a baking sheet with non-stick paper. Beat the egg whites until soft peaks begin to form. Gradually add the sugar and continue beating. Add the other ingredients except double cream and mix well. Spoon meringue mixture onto the baking sheet and evenly spread to create a round meringue around 7 inches diameter. Bake for 1 hour then leave inside the oven to cool wihout opening the oven door. The Pavlova will deflate if exposed to cold air. Prepare the whip cream by beating the double cream until soft peaks begin to form. Spoon dollops of the cream all over the cooled Pavlova. Top with the fruit of your choice, sliced thinly and arranged decoratively on top of the cream. one of my favorite desserts always delicious and light…..